Cooking your Catch allows you to indulge in the unparalleled flavor of freshly caught Alaskan seafood featuring fish and shellfish that you will catch in the wilderness of the Tongass National Forest. Your fishing and culinary journey will begin at a private marina in downtown Ketchikan, where you’ll be completely outfitted in quality raingear, boots, socks, and hats and board your 30-foot Cabin Cruiser. The fishing part of your day will be spent in the protected waters of the pristine wilderness. You will enjoy the breathtaking beauty of the Tongass National Forest where whales, bald eagles and numerous Alaskan seabirds are often seen. An experienced Alaskan fishing guide will take you to his favorite fishing destinations. You’ll have the opportunity to reel in Pacific halibut, rockfish, lingcod, Pacific cod, and salmon if during the salmon runs. The fishing goal for the day will be to catch as many different species as possible to make your meal interesting and enjoyable. You will have a light lunch featuring smoked salmon. After a few hours of fishing, you will cruise back to the private marina where you can take a classic Alaskan picture next to your day's catch. You will meet the Baranof fish monger and the Alaska Fish House Chef as you identify the different species and their importance to Ketchikan, decide which fish you’ll dine on and discuss your chef's cooking recommendations. At the Alaska Fish House, you will have an intimate, chef-hosted dinner featuring your catch of the day. This is a uniquely hands-on dinner featuring flavors and ingredients from the day’s fishing exploration. There’s no fresher seafood than the fish you catch yourself. Please note: Guests must bring currency ($25 per person for fishing license and $15 per person for optional King Salmon stamp) and are encouraged to carry credit cards to purchase extras, such as souvenirs or snacks. For safety reasons, this excursion is not available to expectant mothers, guests with back or neck injuries or those who have undergone recent surgeries. The weather can change rapidly, forcing the vessel to navigate through some sea swell. Wheelchairs need to be standard size and collapsible; no electric wheelchairs/scooters will be permitted. Guests must be able to board and disembark the motor coach and vessel on their own. Each Guest fishes with a provided Penn rod and reel. Guests do the fishing, not the guides. Dress warmly in layers. Sunscreen is also recommended for sunny days. You should never feel that gratuities are expected, but it is customary to leave a tip in recognition of exceptional service in restaurants, taxis and for excursion guides and drivers. It is always up to you to determine the amount. Treat yourself to an action packed rowdy good time at The Great Alaskan Lumberjack Show. Southeast Alaska’s rich logging history comes to life in this thrilling display of woodsmen skills. The world’s best lumberjacks go head to head in more than a dozen exciting events such as chopping, sawing, relay races, axe throwing, log rolling and of course the 50-foot speed climb. Your colorful host will not only introduce the events, but will also offer a historic view of the Alaskan timber industry which has shaped this rugged land. Located a short walk from your cruise ship pier, this celebration of a bygone era is a rip roaring good time and quality entertainment for all ages. A must-do in Ketchikan! Covered, heated and cushioned grandstands make this a great choice on rainy days. Videotaping is not permitted but guests can participate in our annual photo contest. Please note: Dress in layers. Concessions are available inside the arena. Shopping is available before and after the show. This show operates rain or shine in heated and covered grandstands. The show site is just a short walk from your ship and is suitable for guests using a wheelchair or scooter. Video recording is not permitted but still photos are encouraged! Gain a unique understanding of Ketchikan and its Tlingit culture on this guided walking tour of Alaska’s “First City.” Your guide will be of Tlingit descent and will share personal knowledge of the many changes Ketchikan has experienced over the years. The significance of totem poles within Native culture will be explained as you encounter them on your journey. You will walk up infamous Creek Street, the former red light district, and learn of its important economic roll in Ketchikan’s early history. See the historic “Married Man’s Trail” and hear how it received its name. Discover the amazing journey salmon must endure as they head to their spawning ground when you visit a salmon ladder. Trees, shrubbery and flowers are plentiful along the route and your guide will share their importance to the Tlingit’s food gathering practices. Your guide will return you to the downtown shopping area near the cruise ship pier after this easy walk of approximately nine blocks. Questions are encouraged, as your hosts want you to leave Ketchikan with a better understanding of the community and its Native culture. Please note: Dress according to the prevailing weather conditions and wear comfortable walking shoes. This eco-adventure will explore the rainforest canopy with a flight across 7 ziplines, 3 aerial bridges and down a rappel element. A 4x4 Unimog will transport you to the mountaintop outfitting shelter where you will be fitted with safety equipment and taught the basics of ziplining. From 135 feet above the forest floor, you'll traverse zip lines ranging from 175 feet to the 850-foot pulse-pounding "Ben's Revenge." Treetop platforms and 3 hanging sky bridges will offer breathtaking views of the forest and frequent wildlife sightings, especially wild black bears. After completing the zipline course, end your adventure by rappelling to the ground. Time permitting you will be invited to tour the historic Fleenor Sawmill, explore a garden of completed totem poles and visiting the Alaska Raptor Center's Ketchikan Exhibit to see their amazing birds of prey up close. Please note: Minimum weight is 90 lbs. maximum weight is 250 lbs. Minimum height is 5 ft. Children under 18 years old must be accompanied by a guardian. Pregnant women and guests with medical conditions should consult with their doctor prior to participating. All guests will be required to complete a medical waiver form. Closed-toe shoes are required; long pants recommended. Zipline equipment (helmet, gloves, seat harness, chest harness), rain jacket, and storage for your personal items will be provided. Bring your camera, cash / credit card and sun protection. This eco-exploration will include a guided nature walk, bald eagles, a Native Totem Park and a historic sawmill at an exclusive reserve located in the forested mountains at rustic Herring Cove. A pristine natural environment, it is home to bald eagles, black bears, seals and a variety of birds and other species attracted by the major salmon runs in the abundant marine estuary. A professional naturalist will guide you along an improved trail through the heart of the dense forest, among tall stands of hemlock, spruce and cedar, stopping at strategically located viewing areas. At a protected, open estuary, you’ll follow Eagle Creek along an elevated wooden boardwalk overlooking grassy wetlands. Major runs of salmon return to spawn here. Listen to the symphony of bird activity in this spectacular setting. Seasonal ecosystem changes result in varying levels of wildlife activity. After a half-mile trail walk you will have a chance to see the historic Herring Bay Lumber Company sawmill, visit birds of prey up close at the Alaska Raptor Center Exhibit, and visit a Tsimshian totem park that includes a 40-foot totem and many other poles, all created by one master carver. Shop for unique gifts at the General Store. Transportation to and from the sanctuary will be by motor coach. Please note: Wildlife sightings are likely but are not guaranteed. This tour will operate in all weather conditions. Rain ponchos and storage for your personal items will be provided. Wear comfortable walking shoes and warm clothing. Bring your camera, binoculars, cash / credit card and sun protection. Avoid bringing food and other scented items. Discover Ketchikan’s breathtaking natural sights and tasty flavors at the historic George Inlet Lodge. Begin your tour with a scenic drive to the lodge and encounter canneries, an old sawmill, and decorative totem poles along the way. 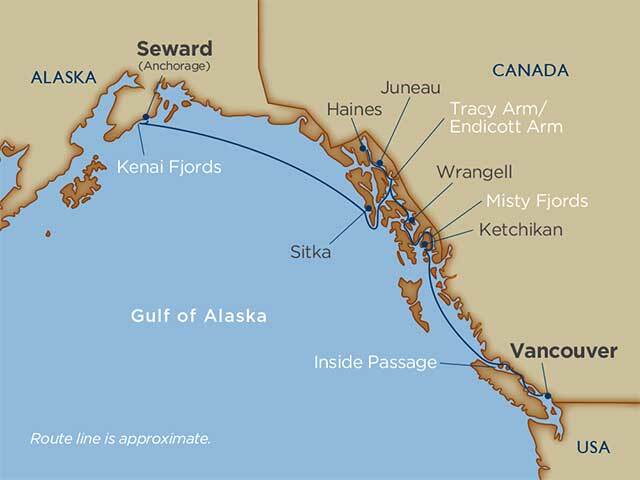 Upon your arrival, board a fully enclosed, heated vessel for a narrated 7-mile cruise through George Inlet and the Tongass National Forest. You will see snow-capped mountains and waterfalls, and learn about the area’s crabbing history. You will even pull crab pots and check out the catch. Next, relax at the charming George Inlet Lodge, a historic cannery building converted into this elegant ocean-side lodge. Enjoy a mouthwatering feast of all-you-can-eat Dungeness crab, romaine salad with Asian vinaigrette, steamed baby red potatoes and blueberry cheesecake. Please note: There is a restroom available on board the vessel. There are 79 steps down the hill from the parking lot to the lodge and a complimentary shuttle available for those guests who need assistance down the hill and back up. One Beer or wine is included in the price. Alternative menu items include grilled, cajun, or lemon-peppered chicken and pasta with pesto sauce. Bring your camera and your appetite! More than a simple transfer, this tour will offer a deeper insight into the local region. See the area with the assistance of the locals! Your narrated tour will start as soon as you get off the ship! Learn more about the local history, flora, and fauna as you travel north to Alaska's largest city, Anchorage. You will take a City Tour that includes both the history of Anchorage as well as life in this modern, American city. There will be time on your own for shopping and lunch in the downtown area. After lunch you will be transferred to the Anchorage Museum of History and Art. You will be at your leisure to explore this world-class facility. The tour ends with an included transfer to the Hospitality Suite Hotel (Hilton).